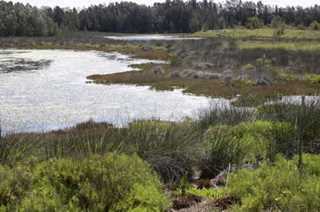 Wetlands along the Mexican side of the Gulf Coast of Mexico consist of numerous large complexes of fresh, brackish and salt marshes and mangrove swamps. These areas are negatively impacted by oil drilling, dredging, shipping, agriculture and urban development, as well as natural events such as hurricanes and flooding. There are five wetland areas that make up the most important habitats for wintering and resident waterfowl: Laguna Madre in Tamaulipas; Tamiahua and Alvarado lagoons in Veracruz; Centla Wetlands in Tabasco and the complex of wetlands in Campeche-Yucatan. DU must work in partnership with municipal, state and federal governments and with local and national non-government institutions to conserve the most important wintering habitats for migratory and resident waterfowl. 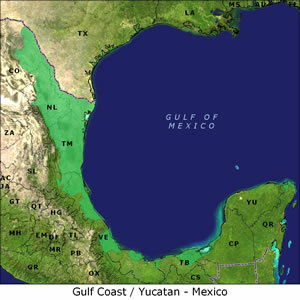 The Gulf Coast of Mexico supports 35.2 percent of the wintering waterfowl in Mexico. The Laguna Madre in Tamaulipas is a key wintering habitat for 36 percent of the North American population of redhead ducks. The Tabasco, Campeche and Yucatan lagoons are key wintering habitats for the blue-winged teal. Surveys in 1994 recorded a total of 818,015 ducks and 16,795 geese along the main wintering areas in the Gulf Coast. The Laguna Madre and the Tamiahua and Alvarado lagoons need formal protection through legislation or regulation. There is a great need to work with state and federal governments to design roads that cross wetland areas to avoid future wetland loss and to correct past negative impacts. Along the coastal plain of Tamaulipas freshwater wetlands are key water sources for migratory waterfowl and are in need of protection or restoration. Develop a wetland conservation plan for Mexico's Gulf Coast. Seek protected status for habitats that remain vulnerable to loss and degradation. Complete wetland classification of the most important habitats for waterfowl along the Yucatan Peninsula. Restore the most damaged wetland areas in the states of Campeche and Yucatan, caused by natural events or human activities.